I consider myself to have a fairly good diet – why are my nails so brittle? The main cause of splitting, peeling or brittle nails is dehydration. This is more apparent with fair skin, which has less keratin that in turn gives a weaker softer nail. Nails can be damaged by over using harsh chemicals found in gels, acrylics and many household items. Try the Nourishing Nail & Cuticle Serum twice a day and you'll be astounded by the speed of repair – great to wean yourself off gels. It's important that the nail bed and cuticles are kept moisturised too as this will keep them looking healthy and will in turn promote strong nails, reduce ridging, dehydration and tatty cuticles. My nail varnish always seems to chip after a frustratingly short time. How can I make it last? Ensure you moisturise beforehand as brittle nails will cause the polish to flake off. I love to use the Intensive Treatment Foot Oil as it can give a good seven days more longevity to any manicure or pedicure as it conditions and treats the nails, instantly re-hydrates the cuticles, illuminates the skin and it brightens the polish without dulling the colour at all. If you paint your own nails it's really important to seal the edges with the nail polish as well to prevent chipping. Why has my nail colour changed? Colour changes in nails can occur when nail polish that has leaked into the nail plate – this is especially noticeable with a deeper shade or even fake tan. Also, as we get older, the nails can become thicker and this can give rise to slight yellowing as the opaque layers of nail thicken. Why am I getting ingrown nails? - Ill-fitting footwear can be a culprit, so make sure to wear shoes that aren't too pointed or squashed at the toes. It's very important that toenails are cut properly – so not too long or short, always straight across and never pick the big toe nails or perform home treatments on sore nails – you can do more damage than good. Ensure that socks and tights fit properly and they aren't pulled too tight as this restriction can lead to ingrown toenails. Why do my nails get to a certain length and break? Much will depend on the strength of the nail – if they're weak then as they grow they are more readily exposed and more likely to break. 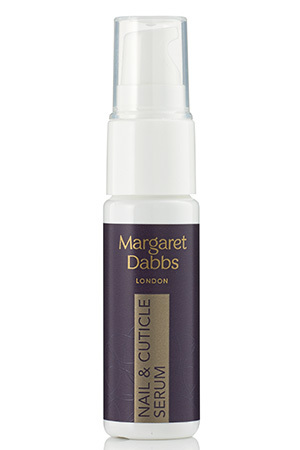 Use our Nourishing Nail & Cuticle Serum; you'll be amazed at the difference. I dream of long, elegant nails but don't know where to start. How can I make them grow? - Drink plenty of water and follow a healthy, balanced diet to ensure your skin and nails are getting the nutrients they need. How do I prevent the hard skin on my feet? 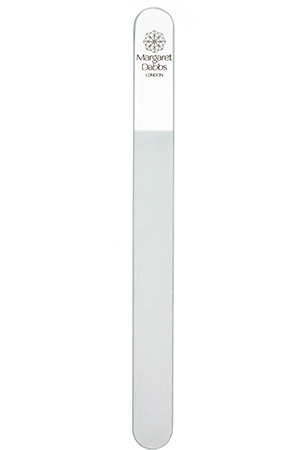 Ill-fitting shoes are the most common cause of hard skin, so I'd advise you invest in a good quality foot file. 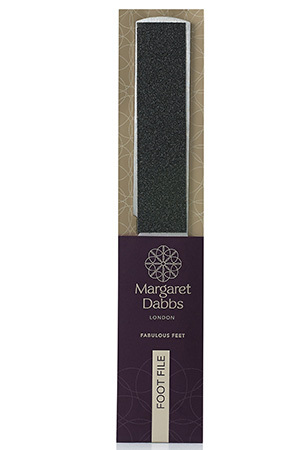 Everyone should have the Margaret Dabbs London award-winning Professional Foot File. It's strong, has a long handle for ease of use, and removes skin safely, finely and evenly, and, if used on dry skin, will give long lasting results. Ideally use this once a week and follow with the Intensive Hydrating Foot Lotion, which is formulated to slow hard skin build up. These two products together are used in all our professional pedicure treatments and are results driven. Why do I keep getting corns on bunions? Bunions form from the deviated big toe, which can be a result of poor footwear or hereditary issues of the joint. If the bunions protrude and are rubbed by footwear a corn can appear over the central. The pressure of pressing or rubbing needs to be removed to stop this happening. What five products would you recommend? What key things do you wish clients knew before they enjoyed a mani or pedi? - Pedicure treatments should always be started on dry skin – no exceptions. This is a new concept to most people but when you consider the reasons why, it makes perfect sense – wet skin masks the areas to be treated – so you cannot see the dry skin areas as well. Water softens the tissues, so if you're prone to cracked heels this will increase the risk and using a foot file won't remove the skin as well and is more likely to actually tear it. 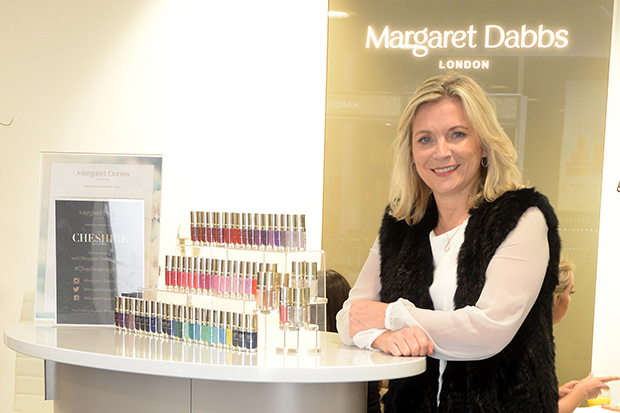 -One of the biggest beauty concerns at the moment is the way hands give away our age, and yet people are having gel nails applied weekly, which utilise ultraviolet treatment lamps that age and damage the skin. 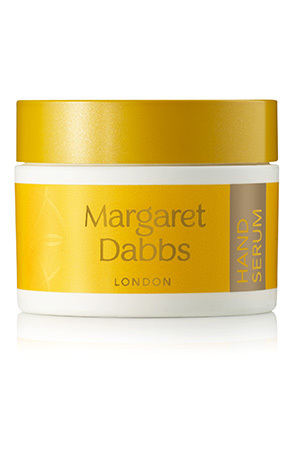 The best thing to do is avoid gel manicures altogether and opt for treatment-enriched nail color range such as The Margaret Dabbs London Intensive Anti-ageing Hand Serum. 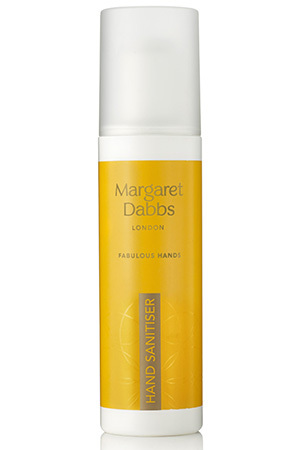 This was formulated to reduce the visible signs of ageing of the hands, improve the appearance and quality of the skin, reducing age spots and creating an even skin tone. I've noticed more and more of my male friends and my fiancé become more beauty conscious. How can I make the most of my manicure and make my nail varnish last? Choose a pale colour as this will help to extend the life of your mani, and use a polish free from harsh chemicals such as formaldehyde, toluene and DBP, which damage, dehydrate and cause discoloration. I'd also recommend you used a decent nail and cuticle serum and always keep a crystal nail file handy so that you can smooth out any snags. What can I do if I accidently cut or catch my cuticles? 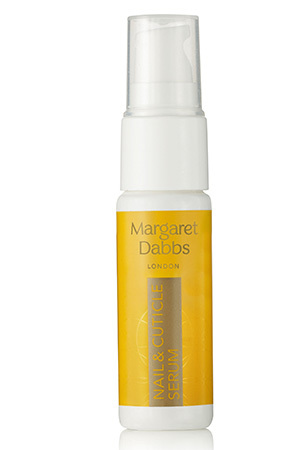 Cuticles should be kept moisturised to keep them soft and slow the build up of tissue in the process. It's better to push them back and never to cut fresh cuticles if you can avoid it. Why do you think the male market is growing? From day one a huge proportion of our client base has been male and this number is consistently growing. I think the male grooming industry has changed a lot in the time I've been looking after feet – men are becoming savvier, better informed and want instant results. They're beginning to pay more attention to their health and appearance and now understand the longer-term benefits of treatments such as our Medical Pedicure. Our clinics have always been a comfortable environment for men and the podiatry treatments we offer are carried out in private rooms so our clients feel completely relaxed. What's the difference between a male and female treatment? 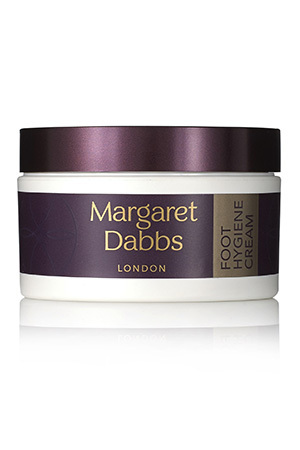 At Margaret Dabbs London we fuse together the best of medical and beauty to produce a range of effective, results-driven yet luxurious treatments and products for both men and women, who enjoy and benefit from what we do equally. The only significant difference between the treatments would be that women love to beautify their nails with our polish collection! 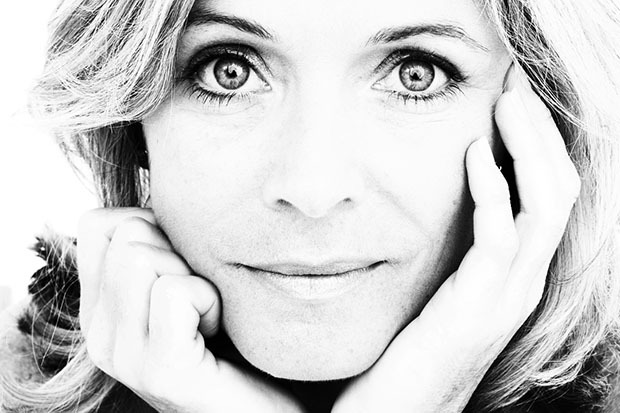 Whoever the client our philosophy is simple – your hands and feet are very important to your look and wellbeing and we give to them the respect you and they deserve.